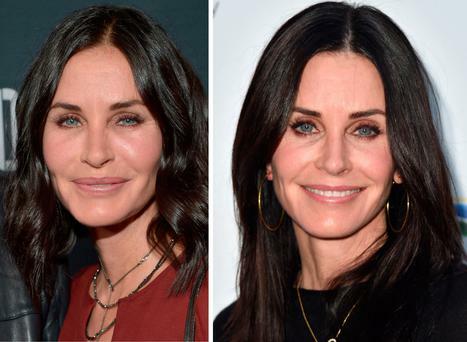 A top plastic surgeon has praised Courteney Cox for encouraging women to embrace ageing and said it was "refreshing" for a celebrity to be so open about cosmetic procedures. In a recent interview, the actress (53) said she regretted undergoing procedures to inject fillers into her face and said she feels "much better" after letting them dissolve. The former Friends star said that because the process was gradual, she did not realise how dramatically her face was changing until it reached a point where she felt she "didn't look right". Irish Association of Plastic Surgeons (IAPS) spokesperson Dr John Curran commended the actress for being so open about undergoing cosmetic procedures and said that the actress's face has a more balanced look than it did two years ago. Speaking to Independent.ie, Dr Curran said: "It's brave and refreshing for her to have come out publicly, encouraging women to embrace and accept the ageing process. Looking at recent images I would say that she looks better - more natural - with a more balanced and normal face. "My guess would be that Courteney had injections of Hyaluronic Acid filler around her face, but especially around the malar or mid-face region. "Potentially she did not realise how unnatural her look had become due to the gradual changes induced by successive treatments." However, the Kerry-based surgeon said that fillers can have a positive and natural result, if carried out by a responsible, skilled practitioner. The IAPS spokesperson said that the star may still have fillers, but her surgeon is using them more moderately. "It's possible that she has decided to stop using injectables. However its also possible that she has just managed to find a practitioner who can deliver a natural and not so "done" look. "It possible to achieve a natural and subtle look with filler injections but it depends very much on the skill, ability and experience of the injector," he said. The actress is said to have been keen to regain her natural look ahead of her wedding to Irish rocker Johnny McDaid. It is believed the pair will wed in Los Angeles this autumn. Speaking to New Beauty magazine this summer, Cox said: "I’ve had all my fillers dissolved. I feel better because I look like myself." "I think that I now look more like the person that I was (before adjustments). I hope I do." "Things are going to change. Everything's going to drop. I was trying to make it not drop, but that made me look fake," she added. "The next thing you know, you're layered and layered. You have no idea because it's gradual until you go, 'Oh, s***, this doesn't look right.'" "You need movement in your face, especially if you have thin skin like I do. Those aren’t wrinkles, they’re smile lines. I’ve had to learn to embrace movement and realize that fillers are not my friend." Meanwhile, Dr Curran urged anyone considering fillers to seek out fully trained plastic surgeons to carry out the procedure. "The view of the Irish Association of Plastic Surgeons is that only fully trained plastic surgeons should engage in filler injection treatments," said Dr Curran. "An obvious potential advantage of seeking such a practitioner is that its possible to achieve subtle, pleasing results. Also there are potentially real and significant complications associated with filler injections - fully trained plastic surgeons are equipped and experienced in the measures required to reverse or manage these potential complications." A full list of IAPS members is available here.